I am a French citizen, living in Asia for 5 years now, married with my beautiful wife, Caroline and we are blessed to have 3 lovely children, Noemie 8, Anthonin 6 and Mathilde 2. They give us joy and satisfaction every day. First up – Tell us a bit about yourself. I am a French citizen, living in Asia for 5 years now, married with my beautiful wife, Caroline and we are blessed to have 3 lovely children, Noemie 8, Anthonin 6 and Mathilde 2. They give us joy and satisfaction every day. I started triathlon 4 years ago in Thailand doing my first 70.3 in Phuket casually with friends. I completed it in 5h48. I was able to improve over the next few years to 5h19, and then 5h08 last year. I joined MetaSport in September 2015. It was the perfect place to meet great people and this is where I got my first taste of structured ‘proper’ triathlon training. I told my wife that I would do an Ironman before I turned 40. She said OK.
How did you feel crossing the line of your 1st Ironman in such an impressive time? Was this a goal you had set for yourself? 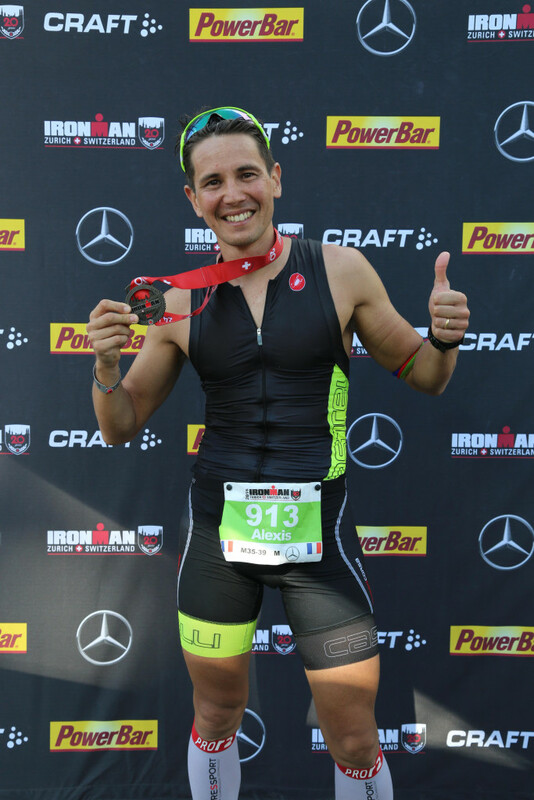 It was an amazing feeling and I finally knew what the Ironman tag line, "Anything is Possible", meant. It is something that I want to instil into the lives of my 3 children; that at the right time and with the right preparation and people guiding them, “Anything is Possible”. I was so happy to see Caroline and my 3 children cheering for me at the finish line. It was one of those "Life is Beautiful" moments! 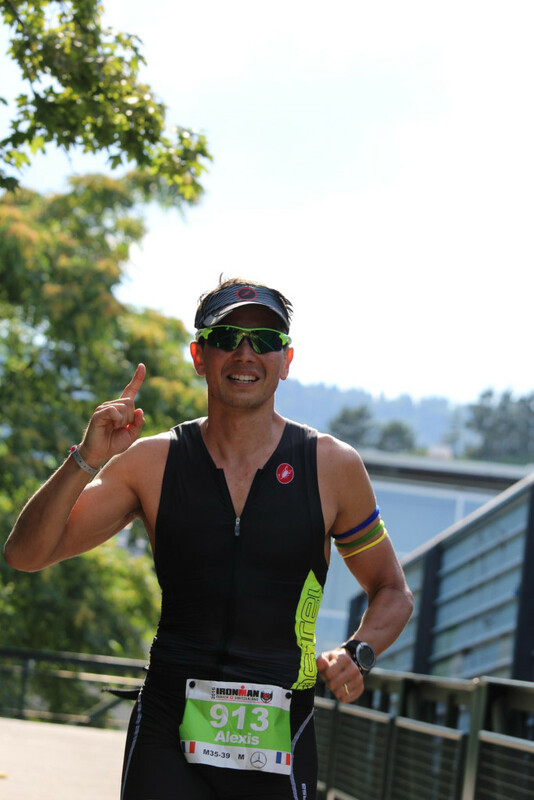 Zurich was not known to be the easiest race for a first IM, 1600m uphill bike, 4 laps run in the city with paved roads. The Swim: I started the swim easy as this is not my best discipline. The plan was to simply replicate what I had done in training, a steady swim with no dramas at 1'50”/ 100m pace. Ticked that box off, 1 down, 2 to go. The Bike: The bike 2 loops through the beautiful mountains with an amazing view of Lake Zurich. I was able to hold a steady 36km average on flat portion and saving a little for the big hills to come. It was amazing the feeling to have people cheering for you at "Heart-break Hill". A couple of steep descents at 75km/h were scary! I finished up the bike in 5h33', a bit tired but happy that I had managed my nutrition well and had no stomach issue. 2 knocked down, 1 more to go. The Run: I started EASY at 5'20" pace, focusing on my keeping to a high 88 stride rare. The first two laps where ok, but by the 3rd lap, I could feel myself slowing down on the 3 lap. “You’ll never make below 11h, Come On Alex, Wake Up!” I refocused on my cadence, and concentrated on maintaining the pace. I was able to run the last 5k strong and came in in 10h58' with a 4h marathon. It was such a great moment to hear "You are an Ironman!" As IM was a big unknown to me, I started working with Shem 6 months before this. He helped me with individual coaching and tailored training plans. The schedule was tight, but he accepted the challenge! 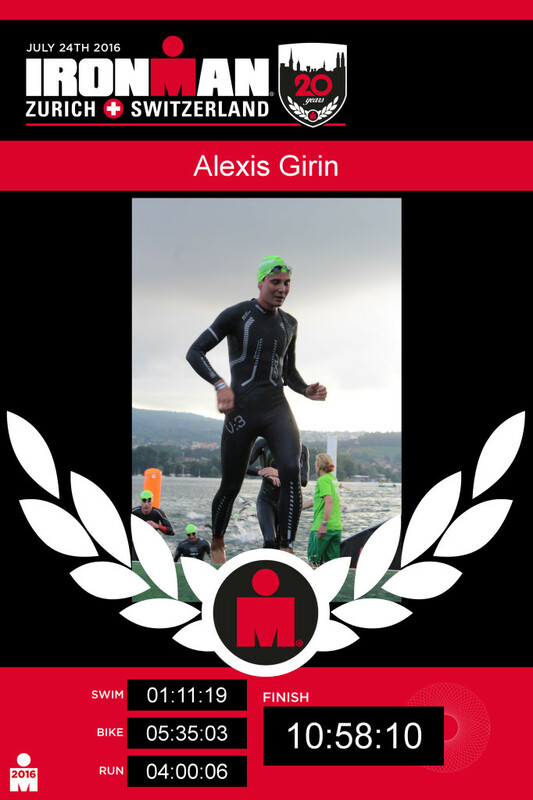 I wanted to master the 70.3 with a sub 5hr performance before making the big step to Ironman. 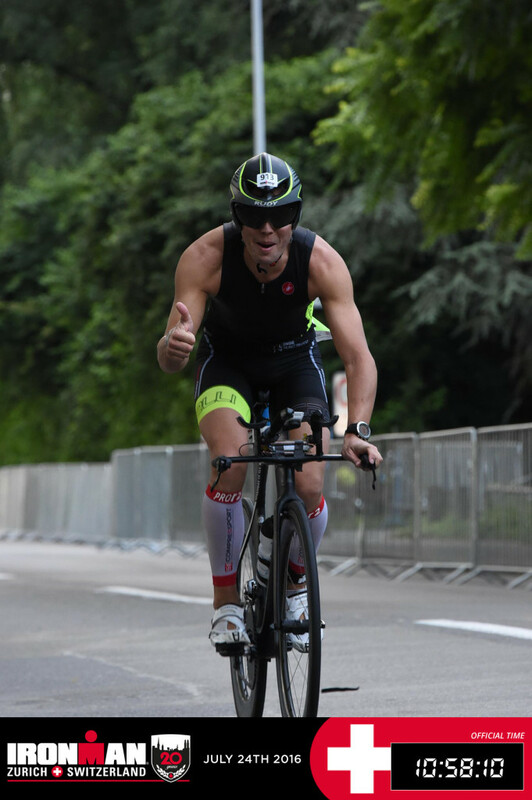 So on the road towards IM Zurich, I decided to race 70.3 Bussleton which was good timing for a training race towards Zurich. Busselton 70.3 was key in my preparation because it helped me to focus on speed and strength while forgetting about IM for a bit. We planned to use 70.3 Busselton in May as a training race. We focused mostly on building strength on the bike which Shem identified as one of the more significant areas to work on. After just 1 month of training, I smashed my PB in Busselton with a 4h45'!! I was surprised with my result (31' swim/2h33' bike / 1h36' run) and the focus on building bike fitness paid off. I was able to ride hard and still feel fresh to do a great run off the bike. This result was great for confidence and gave me positive energy to stay focused on the volume phase of our IM training. In the build up to Ironman Zurizh, we used an Endurance Block 2.5 weeks before the IM race. It was the toughest training I had ever done. Sleep , train, eat, rest, train, eat ,sleep… exhausting both physically and mentally, but perfect for IM training! I started to understand what Shem was trying to achieve with my fitness when he talked about ‘Bombproof Legs’ and ‘Fatigue Resistance’. After this block of training, mentally I was now prepared for anything on IM race day. I had done 250k biking, 5km of swimming 30km of running in 3 days, after which I was dead After this I enjoyed the taper and the build into the race. Let's talk about your training. Can you briefly describe your weekly training schedule? How and why that's working for you. Training every day! TheMethod! A bit scary at the beginning but in the end it worked out well for me. I swam and ran with MetaSport on Monday and Tuesdays. Bike Trainer sessions were on Wednesdays and Fridays, with another swim on Thursdays. Saturdays were the long run and Sundays were the long bike. It is also vital to have discussed this with the family and having the support and understanding from them in the training plan for the next 4 months was a huge part of it. I am blessed to have such a loving wife! Please share with us the 2 most important 'take home' messages that you have learnt about endurance training that everyone needs to hear. Plan well: for this: I wanted to have 4 months of full on IM training as this was my #1 priority. Thankfully, everyone at work and in my Family was supportive! This was very important so that I could have peace of mind for my training. Consistency and Intensity; Train every day and do the hard session HARD. Don't cheat yourself. Make the effort to mentally prepare for a hard session. Also race at the pace you trained. Don’t try anything new on race day. I always stress the importance of communication in the coach -athlete relationship, your thoughts on this please. In my case, it was important to communicate with Shem weekly to inform him of travelling plans and changes to training facilitates so that he could adjust the plan. He was also able to understand, mentally, where I was coming from. This is key. Any 'life lessons' you've picked up along your journey towards your 1st Ironman? Anything Is Possible. It depends how hard you want it and how well prepared you are. To me triathlon is the perfect sport of most of us who have heavy business schedule. So rewarding to see how much progress you can make if you are consistent! Inspiring for work and my team too! Having a coach is a kind of like "insurance": you know what you’ll get. And when you are about to devote 4 months of your time for something you’ve never done before, which will impact your family life, you’d better make sure you cross the finish line with a big SMILE!! To me getting Shem on board as my coach was a no brainer to ensure I didn’t break myself in training and to finish well. The key skills that a Coach needs to possess, apart from a sound training philosophy, are communication and the ability to understand an athlete’s personality. Shem was able to build that rapport and trust, because, in the end, it is all about the MENTAL ATTITUDE and motivation. Phuket 70.3 – I’ll be racing with my mate Ben C, so he’d better watch out! And then Nice Full IM in June 2017. It is meant to be a beautiful but hilly race!